God created for us to see. can ever provide your mind. or tell you they're sorry but they just cannot be. and its more than some will ever see. Posted in poetry, Uncategorized and tagged adventure, books, expand your mind, travel. Bookmark the permalink. Cleaning our home office has yielded the discovery of many treasures, such as this poem. I had long forgotten its existence, but when I found it, I remembered the point when I came to the epiphany that in neglecting my writing, I had neglected a part of who I am. It’s not always easy to find time to write, and the world around me often leaves me unable to sneak in even a few sentences, but I need it as often as I can. I need words. Now bring me to life! no longer who I used to be. to find my inner self? Can words bring me back to life? My soul has no voice. My heart bereft of inspiration. 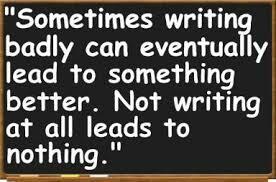 Posted in Author, Creative Writing, poetry, Reflection, Uncategorized and tagged inspiration, need to write, poetry, words are life, writing. Bookmark the permalink. I have notebooks and folders scattered and tucked into dark places throughout my house, and most of the time, I forget they exist. I’ve been on a cleaning and organizing binge as of late, and I have found odd, mysterious little treasures. Many writers save everything we’ve ever written, not so much because we really like most of it, but because we figure there’s a chance some of it will strike inspiration into us later. 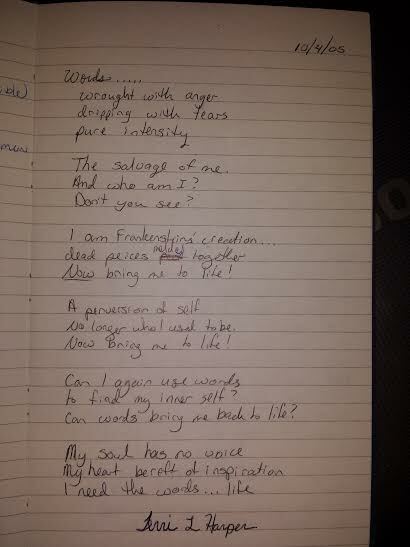 I don’t know how inspiring these little bits of poems actually are, and I have no recollection of actually writing them, though it is undeniable that this handwriting belongs to me. Perhaps there never was an occasion for the words, but rather an idea for characters in a story I locked in the back of my mind. I don’t even have any clues to when I may have written them. Anyway, here they are, just for fun. I found an old photo of you and me. to help stop the mourning. Posted in Author, Creative Writing, poetry, Uncategorized and tagged dark poetry, found poetry, poet, writer, writers quirks, writing inspiration. Bookmark the permalink.